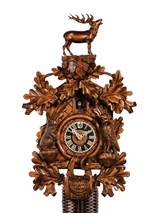 At My Cuckoo Clocks, we offer a huge selection of Black Forest hunter cuckoo clocks. The Black Forest, located in southwestern Germany, is the birthplace of the first cuckoo clocks and quickly became the central hub for the cuckoo clock tradition. The clock makers in the region were responsible for developing many of the designs and technical improvements that made the cuckoo clock the work of art that it is today. Black Forest day cuckoo clocks not only keep the time, but are also filled with the rich traditions of the cuckoo clock�s early beginnings. Black forest day clocks exhibit the expert craftsmanship that has been passed down over generations. Owning one is truly owning a part of history, so take advantage of our huge selection. If you have any questions, please don�t hesitate to contact us.